Great gift idea and product for the home office (and regular office for that matter). 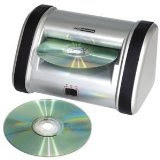 Norazza's CD and DVD Data Destroyer damages disks on both sides making your unwanted DVDs and CDs unreadable. This helps prevent unauthorized use of data stored on discarded CDs and DVDs and eliminate the risk of corporate and identity theft. The Data Destoyer "destroys" fifteen disks per minute and is compact and easy to store and use. Norazza DD3001A CD and DVD Data Destroyer @ Amazon.com .